Reports of gay men being detained, tortured and killed by officials under the control of Chechen leader Ramzan Kadyrov, have hit headlines around the world and provoked anger and protests from LGBT, democratic rights and socialist activists. Socialist and LGBT activist in Russia, Igor Yasin, looks at this barbaric story. This year the mood at the LGBT “Rainbow week” festival in Moscow was serious. On April 1, reports appeared of the murder of gay men in the Chechen Republic. As a result, the largest gathering organised by LGBT activists in Russia, for some time, became an emergency session to discuss the brutal attacks in Chechnya. Sharps discussions about how best to act in such situations have taken place for some time, but they had not been focused on the situation that has been developing in Chechnya for some years. Secret prisons did not just appear yesterday and they are not just for gay men. So-called “preventative” campaigns have been directed not just at those suspected of “extremism” (not just religious, but also political), but also at any opponent of the local “Padishah” (Iranian for “master-Shah”) as local dissidents call the leader of Chechnya, Ramzan Kadyrov. These repressive campaigns have been directed against those suspected of extra-marital relations, people drinking alcohol or even those breaching traffic regulations. The local police structures have long ago taken over the function of “moral guardians” in Chechnya. It is not that the Kadyrov regime is highly moral, but the struggle for “moral purity” can be very profitable. Several gay people have been blackmailed by the police for years, having to hand over large sums to be left in peace. The Kadyrov regime developed out of the conditions of Russian gangster-capitalism and from the two Russia-Chechnya wars (1994-1996 and 1999-2000) and has absorbed all the worst aspects of the reactionary pre-war regime and Putin’s kleptocracy. Chechnya is one of Russia’s poorest regions, with high unemployment (17% in 2015, second only to that in neighbouring Ingushetia at 30%), a high population density and birth-rates. Around 35% of the population are unemployed youth and children. Against this background of poverty and unemployment for the majority of Chechens, the wealth and luxury in which the Kadyrov clan live is particularly striking. Kadyrov is one of Putin’s most loyal henchmen, but this loyalty costs the Kremlin dear, not just economically but politically. In recent years, there have been many scandals, physical attacks and murders in which the Kadyrov regime has been implicated. But the price paid by ordinary Chechens is even higher: they have to live under conditions of a harsh antiquated dictatorship, where even the bad Russian laws and institutes do not function. In recent years, Kadyrov succeeded in not just strengthening the power of his own clan, but in restructuring Chechen society in line with his own views. Some time ago, he declared that women in Chechnya have become “too unbuttoned” and it was time to “tie them up.” Today, in Chechnya, there is a dress code for women, a ban on the sale of alcohol and several other rules which it would be impossible to implement in other Russian regions. Now they have turned on the LGBT community. It seems that the spread of social networks (ironically encouraged, to a degree, by Kadyrov), has meant that gays, even in small and conservative Chechnya, have become too visible for the liking of the regime. Some unknown incident “provoked” a wave of “preventative reprisals” against the “people of the shadows” as the LGBT community is known. Initial statements by Chechen state bureaucrats justified these actions. The substance of threats to “retaliate” against the editors of the Russian opposition paper, Novaya Gazeta, and other journalists who exposed the attacks on gay people, indicates that the Kadyrov regime is not primarily concerned about the accusations of reprisals or killings but are most upset at the idea that gays even exist in Chechnya! The Kremlin, through its press-secretary, Peskov, criticised the threats against journalists, but avoided addressing the most serious accusations of killings, by claiming there is no reliable information. Kadyrov is, once again, confirming his reputation as an uncontrollable regional leader. In the current climate of a sharpening of relations between Russia and the West and the growth of domestic instability in Russia and new mass protests against corruption, this latest scandal in Chechnya is just pouring oil on fire. It seems that for this reason that the Kremlin is diligently trying to ignore events in the south. At the same time, the scandal has quickly generated a few myths in the West. For example, there is a story that “the first concentration camp for gays has been established in Chechnya.” The truth is that these “secret prisons” have existed for some time in Chechnya, they were used to deal with any “undesirables,” and until recently they did not attract any attention. There are many now who think that what is happening in Chechnya today is simply a result of homophobia, but the problem is much more wide. The Kadyrov clan has established a harsh dictatorship, with practically the complete support of the Kremlin, and it is holding in fear almost half a million Chechens and defying even elementary rights, including the right to life. Nevertheless, Kadyrov presents himself as a “Padishah,” organizing expensive conferences, sporting and cultural events in the capital city, Grozny. The irony is that many Russian and foreign stars, including gay people, readily participated in these events, accepting expensive gifts from Kadyrov and describing him as their “friend.” While French actor and tax-exile Gerard Depardieau, and others like Liz Hurley and Vanessa Mae are among the more notable stars who fawningly praise Kadyrov, gay people who live in Chechnya are threatened so that it is not even possible to talk of the existence of an LGBT community in the region. Gay people describe themselves as the “people of the shadows” and living in the shadows is what many are forced do the most they can do in this climate. Western stormy protests against the “gay concentration camps” are motivated by genuine concern and solidarity. But they do not adequately take on board what is happening on the ground in Chechnya. It allows the local reactionaries in Chechnya to reduce the whole issue to an attack by the “Godless west” against local “traditions” and drags the whole discussion about violence by the authorities into a simple argument about prejudice. While there are undoubtedly bigoted figures in the Kadyrov regime, the policy of repression is also part of a wider attempt to suppress opposition. The neighboring republics to Chechnya are also in turmoil. Dagestan has become the centre of an-all Russian federation strike by long-distance lorry drivers, who face repression from Putin’s newly-formed National Guard. Dagestan is also the scene of protests by the relatives and friends of people who have been unjustly arrested or subject to police violence. In Chechnya, such protests are quickly suppressed, but instability is in the air. Last year, the authorities arrested dozens of people on suspicion of a plot to kill the republic’s leader and there are frequent armed attacks on the police. 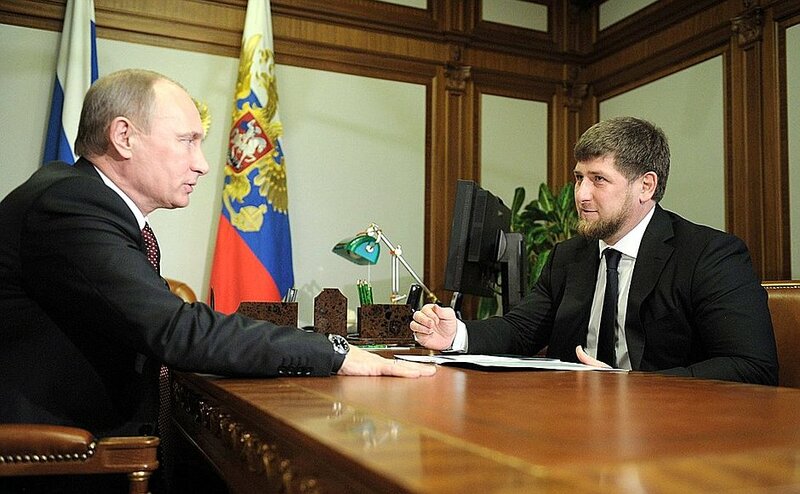 It seems that the homophobic rhetoric by the Chechen authorities, and contradictory statements, are simply to mask the regime’s bewilderment, their lack of confidence and is used as a weapon in their dealings with the Kremlin, to keep the latter from further intervening in the internal life of the Chechnya. What can be done in this situation? For more than two weeks, activists have been helping those who face direct threats in Chechnya and a hot-line has been opened (kavkaz@lgbtnet.org). Gay people, who according to local bureaucrats do not exist in Chechnya, are being helped to avoid reprisals and leave the republic. Politicians often use anti-homophobic rhetoric to score political points and pressurise opponents in other countries, even though their own governments do nothing to stop violence or discrimination against LGBT or improve their situation. This hypocritical approach is called “pinkwashing.” But now these Western politicians have an opportunity to demonstrate, in deeds, their concern by helping gay people, not just from Chechnya but also from Russia, who are facing danger trying to gain safe asylum. In Russia and internationally there are attempts being made to organize pressure on federal and local authorities to stop the current wave of reprisals against gay men and to prevent this practice spreading to other regions. There is a real need for an international campaign; it is necessary to connect the struggle against xenophobia and homophobia with the struggle for democratic rights and freedoms, against the practice of extra-judicial reprisals, police violence and the repression of peaceful protests in Chechnya and Russia. It is necessary to talk openly about the practice of “honour killing” and other barbaric practices faced by women, LGBT and other minorities. No “traditions” can serve as an excuse for the crimes of the Chechen authorities, who organize such extra-judicial reprisals and purges. The Russian Independent Trade Union of Journalists has, since the beginning of April, been at the forefront of the demand for a full investigation into all the attacks and repression, particularly as journalists have been victims of homophobic reprisals. It can be found on Facebook. The Kadyrov regime is threatening reprisals against those journalists and human rights activists who are not afraid to speak openly question what is taking place. Unfortunately the Russian opposition, with a few exceptions, hold their tongues. They have succumbed to widespread prejudices and have not rushed to speak out on this question. But for the developing protest movement in Russia, it is very important that such prejudices – whether nationalist, religious, Islamophobia or homophobic – are not used to divide the working class. Only a united struggle of workers and youth, across all of Russia’s regions, against the barbaric consequences of capitalist restoration, can lead to victory in the fight for economic, social and democratic rights.